If you have a central air conditioning system or a newer high-efficiency heating system you may have noticed a little box sitting on the floor near the system. The little box usually has one or two plastic pipes going into it and a clear plastic tube that leads to a laundry sink or washing machine drain. If you’ve observed this little tank, then you’ve found what’s known as a condensate pump. In the summer months as warm moist air is forced across the evaporator coil by the fan inside your air handler, the moisture in the air condenses and drips into a collection pan. From there it often drains into a conde nsate pump where it is transferred to the outdoors or waste plumbing. Collecting and removing the condensate is pretty straightforward for central air conditioning systems. When it comes to disposing of the condensate for heating systems it gets a bit more complicated. With older boilers and furnaces the moisture and combustion gases produced by burning either fuel oil or natural gas go right up the chimney. Newer high-efficiency boilers and furnaces are frequently referred to as “condensing” because they condense or extract the water vapor out of the flue gases before venting to the outdoors. In this case, condensed water vapor needs to be treated before the condensate pump sends it on its way out of the house. Water vapor that forms from burning natural gas is very acidic. Acidic condensate resulting from this water vapor is destructive to the flue liner of your chimney with low and medium efficiency heating systems. It can really play havoc when it is condensed in a high efficiency system and then transferred by the condensate pump to the sewer system. Condensate with a low pH can foul components in the condensate pump. In older homes with cast iron drain lines, this acidic discharge can eat away at the pipes. Condensate pumps should be installed with all high-efficiency, condensing boilers or furnaces. With newer systems the heating contractor should have also installed a neutralizing filter. This device contains a media that can look like rocks or marble chips, and is designed to offset or neutralize the acidity of the condensate. 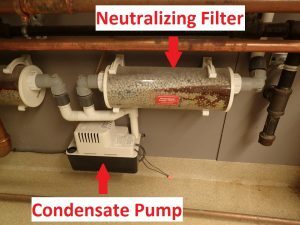 By bringing the pH of the condensate closer to pH neutral (7.0), the neutralizer reduces damage to the condensate pump and the drainage piping. Once the filter is installed, your job is not quite over. Just like changing the filter on your central air conditioning is required as part of regular home maintenance, you must also periodically change the media on the neutralizing filter. You should always follow the manufacturer’s guidelines, but in general the filter media should be changed or refreshed annually.